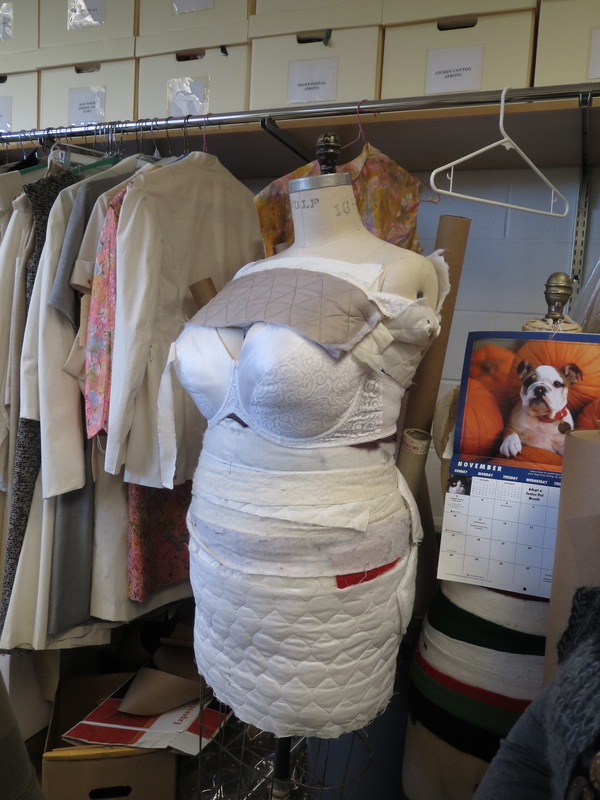 For Pattern Review's anniversary weekend, SewDC arranged for Joe Salasovich, Arena Stage's Costume Director, to give us a tour. What a treat! Joe was incredibly generous with his time and vast store of knowledge. 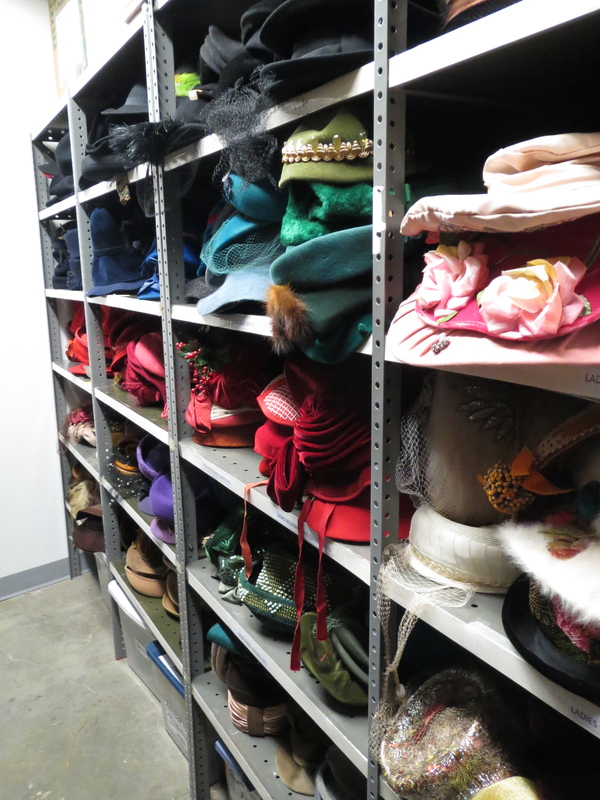 We toured not only the costume shop but the entire backstage area, including the craft shop (where dyeing, millinery, and other non-sewing costume work is done), wardrobe storage, hat storage(!!! ), the wardrobing room, the hair salon (who knew? ), and the scene shop. 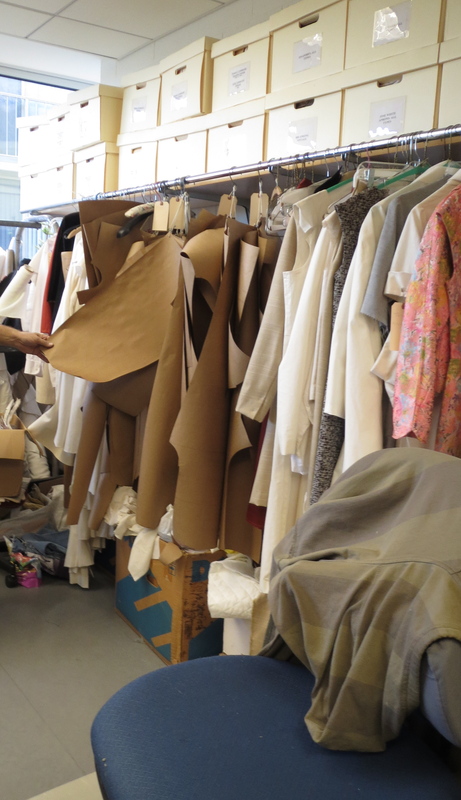 We started in the costume shop, which is full of beautiful dress forms. This padded out form was incredible! Seeing that it is possible to make the form fit any size was inspiring to work with what I have (though my problem is the shoulders are too wide on all commercial dress forms and the bust too large). Joe shared their process for making costumes. 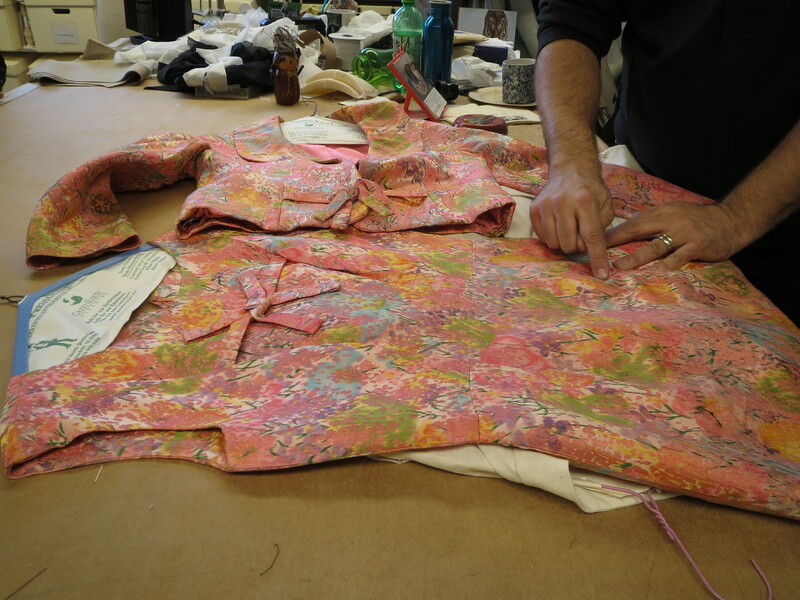 They often start with vintage garments as inspiration, many of which come from his personal collection. 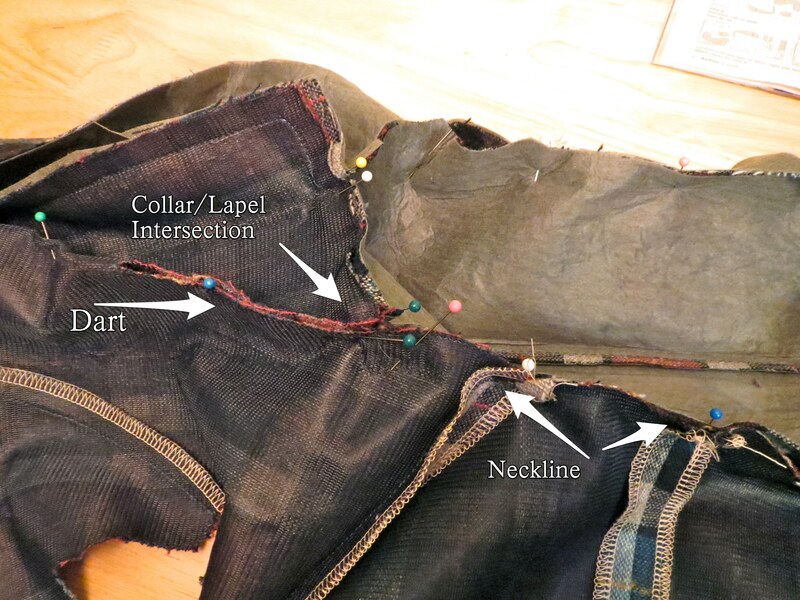 They study the garment and carefully examine the design lines as well as the construction techniques. 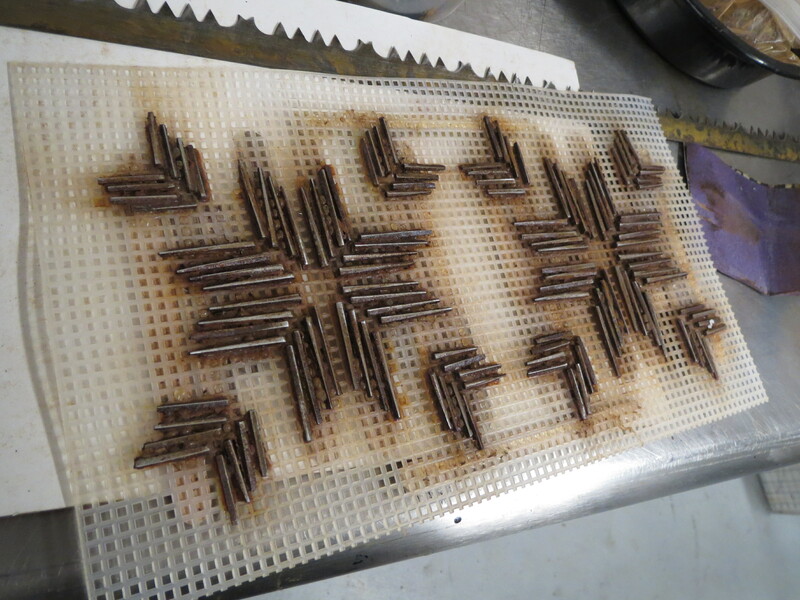 Once perfect, patterns are traced onto brown paper and hung on hooks for future use and reference. 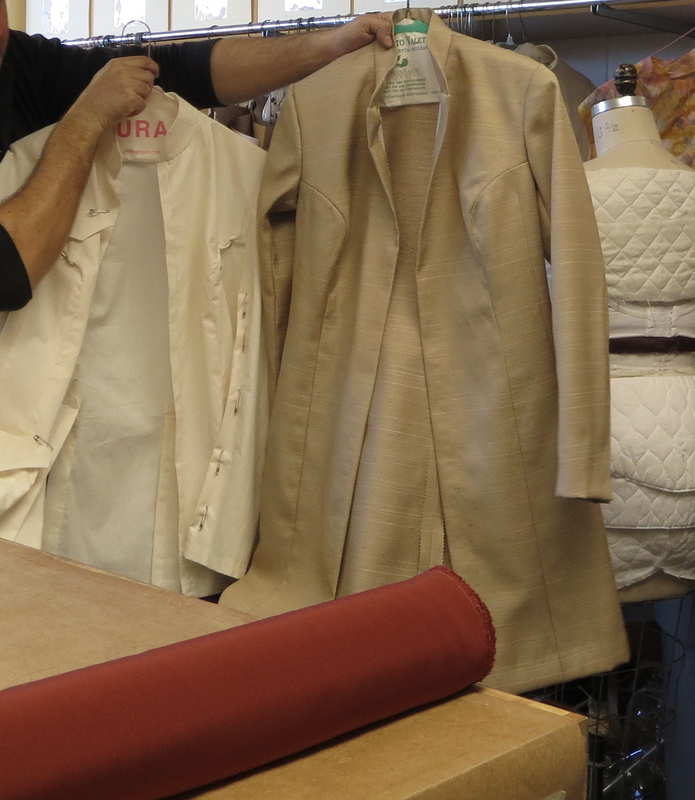 Here's a panoramic view of the costume shop. They have a mix of industrial and home machines. Obscured by the table in the right is the Merrow industrial serger. Gorgeous! The boxes are for storage of notions, trims, decorations, and other miscellany like handkerchiefs. The irons are industrial steam presses, and they use ironing tables rather than ironing boards, with hams and sleeve boards for shaping. 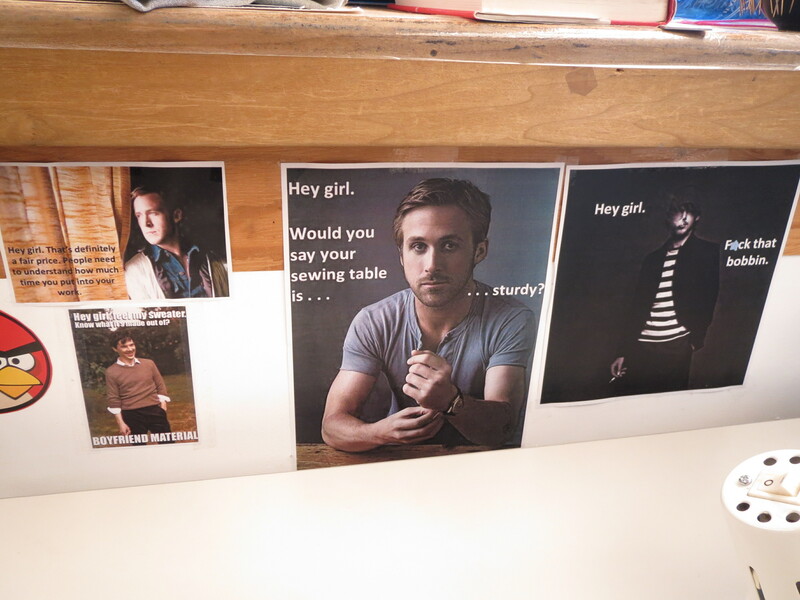 I was quite jealous of the ironing table. One of the questions we had for Joe was whether the clothes were made to look good from the stage or up close. He told us that all the clothes were movie ready. When we passed this jacket hanging in the hallway, I knew he was telling the truth. 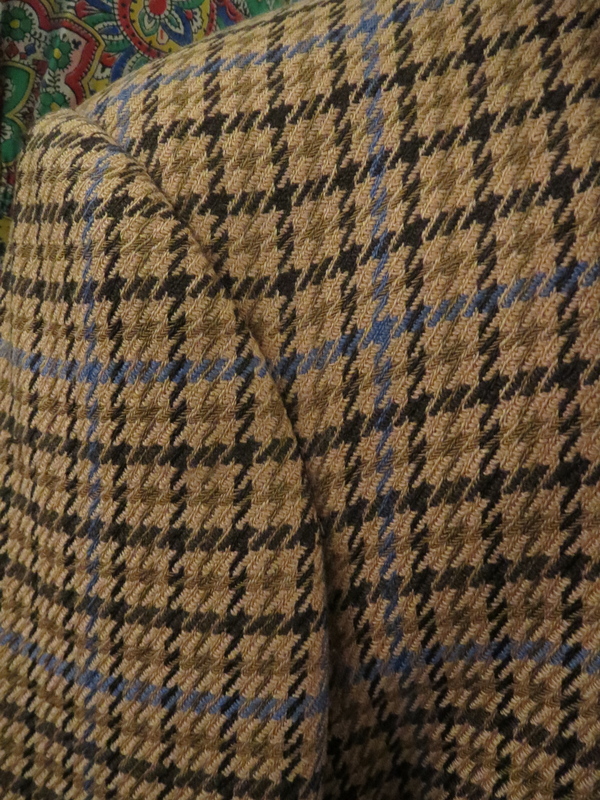 That level of plaid matching blows my mind. The shop encourages creative solutions. 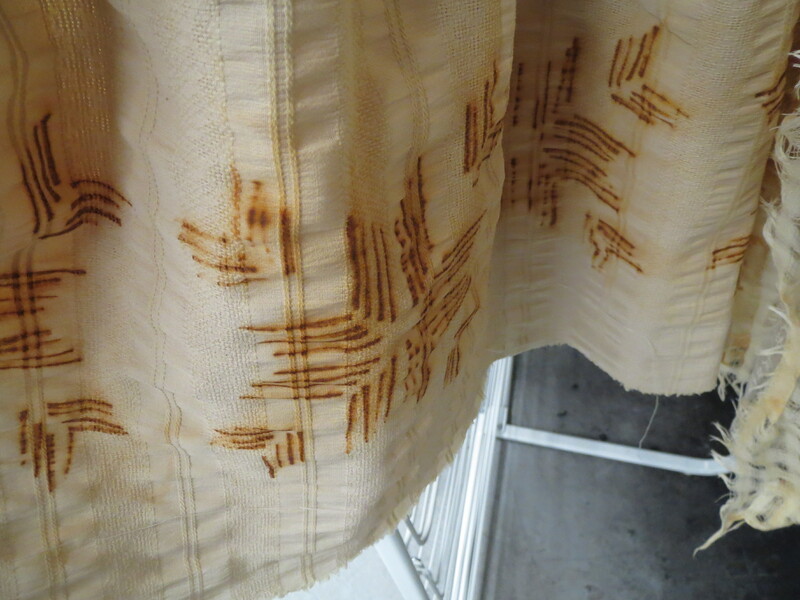 When they wanted to create sort of rough and worn looking garments with a print, they used rusty nails to imprint a pattern onto the hem of a dress. Genius! I would have loved to have spent a couple hours in the hat storage room with a mirror! There were shelves and shelves of hats arranged by color. 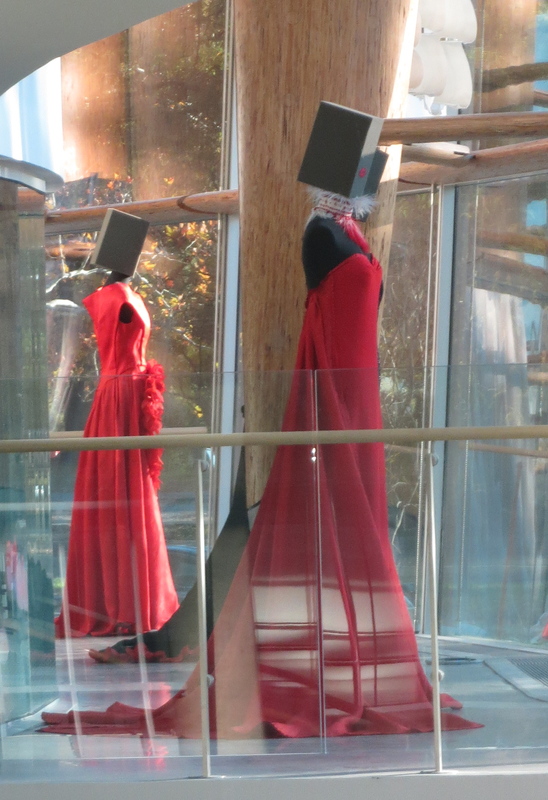 They do some of their millinery in-house; I was drooling at their hat blocks and head forms. Arena is celebrating Italian Culture this year and when we visited was in the process of setting up an exhibit of Italian couture (these enticing shipping crates were in the freight elevator). It was a wonderful tour. 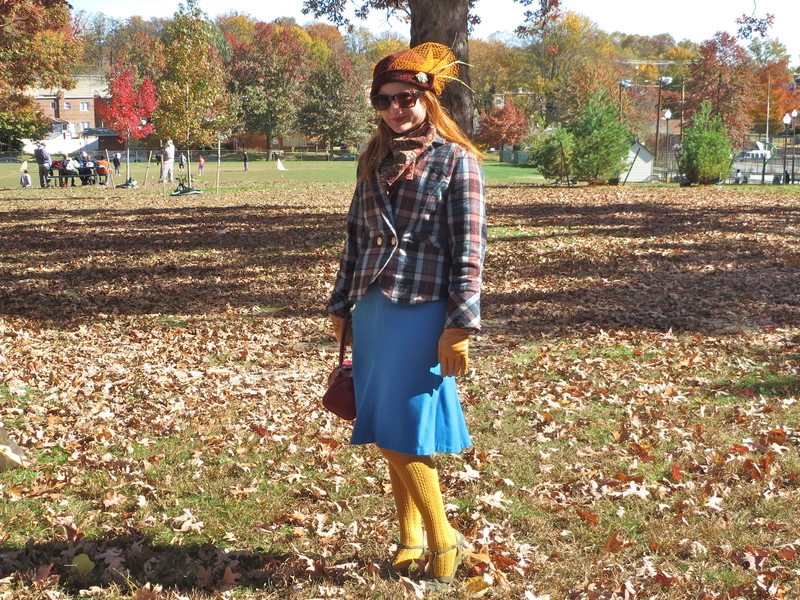 Inevitably for someone who sews, I worked in the costume shop at my college. It was actually a great shop and the theater program at my tiny college is surprisingly professional, but this was definitely a whole new level. 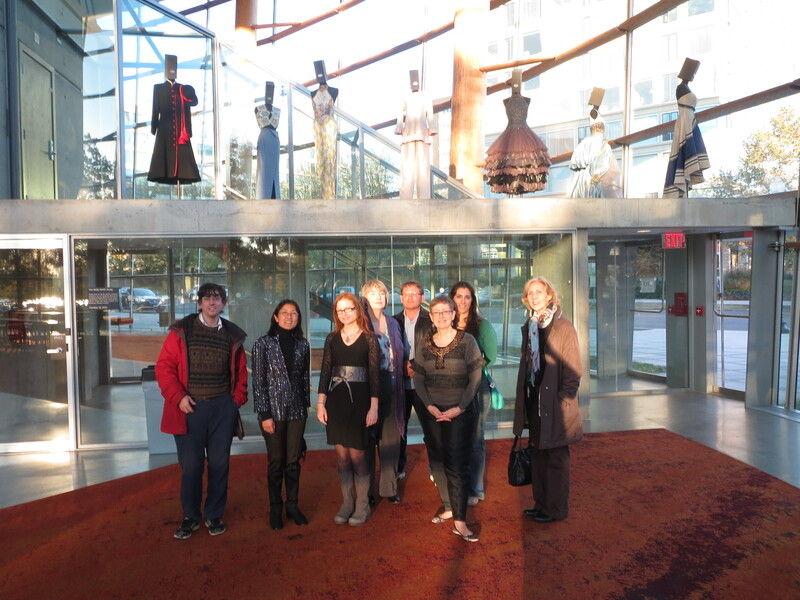 Thanks so much to SewDC for organizing and Joe for the tour and the group photo! 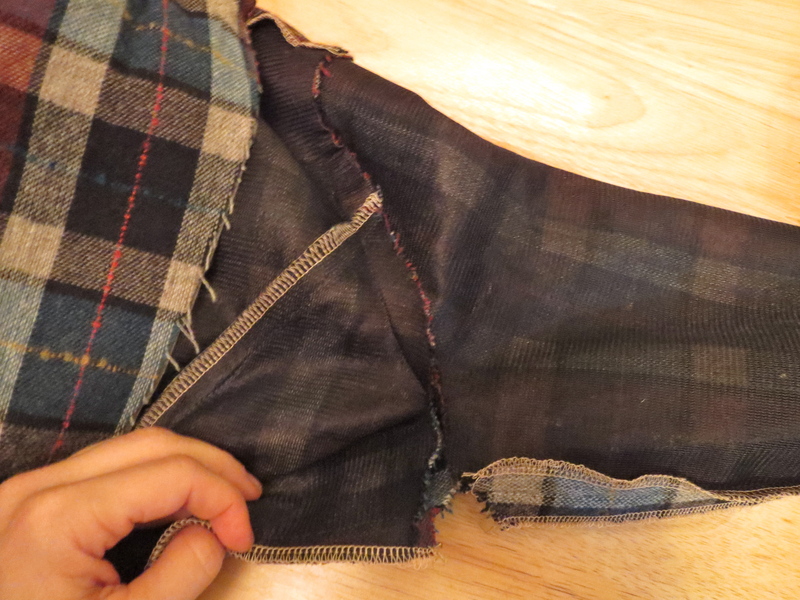 The seams are serged, it has an elastic waist, and I used a machine blind hem to sew the hem and the elastic waist casing. It took 45 minutes and cost a couple of bucks. I had a meeting with outside people, for which I generally tone down my usual "dressing like a parrot" style, so I paired the skirt with a black tee (which also didn't take much more than an hour to make using my TNT tee pattern) and black tights, and a cheap "statement necklace." Easy. And yet, I think just about every one of my (female) colleagues complimented this outfit, and particularly loved the skirt. Maybe I should stop making anything that takes longer than an hour! More photos here. Note: Blogger ate the originally published version of this post--changes were not made to the original text with any malicious intention! The New York Times has done a couple of interesting articles recently on the return of some textile and garment manufacturing to the States. First, they wrote about textile manufacturing, which is returning to US shores where the need for nimble responses to demand is a bonus. The bad news is that the process has become much more automated in the past, and creates many fewer jobs than the textile mills did when they closed down and manufacturing moved overseas. However, to my mind, a few good jobs is better than no good jobs. And the reduced labor costs helps in the competitive pricing area so it's a bit of a catch-22. Then there was an article on the search for skilled sewing labor to keep up with demand for US-made products. When the jobs went overseas all the skills and knowledge evaporated. The few people still around who worked in industrial sewing are generally past retirement age and not looking to return to the factory floor. 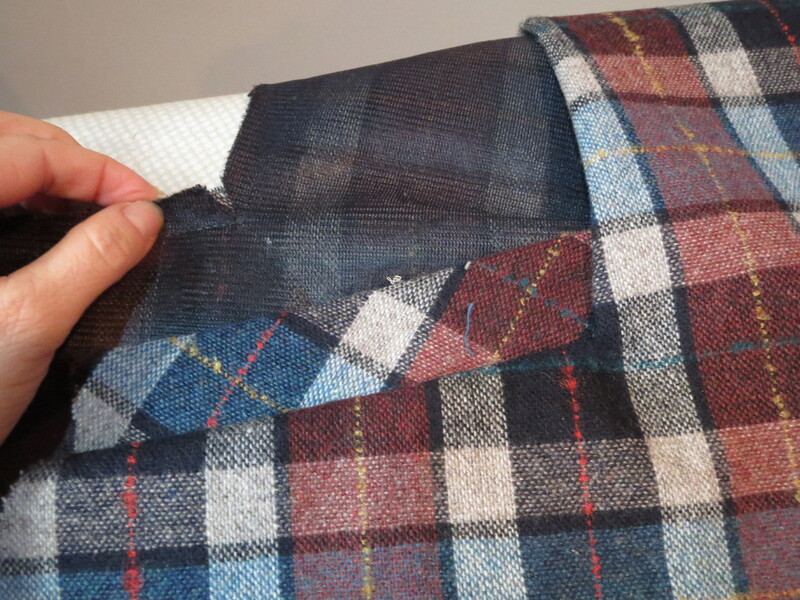 The article profiles a course for factory sewing that can't turn out graduates fast enough to meet demand for U.S.-made products. I am 100% guilty of loving my huge wardrobe and deep closet, but this sort of clothes collecting only became available to the masses when jobs went overseas where labor is such a small part of the cost of clothing as to be negligible. However, labor prices in the third world are rising as money flows into those economies, the cost of living increases, and expectations for standard of living rise. I hope that we are reaching a new equilibrium that allows for liveable wages and good jobs on both sides of the ocean. 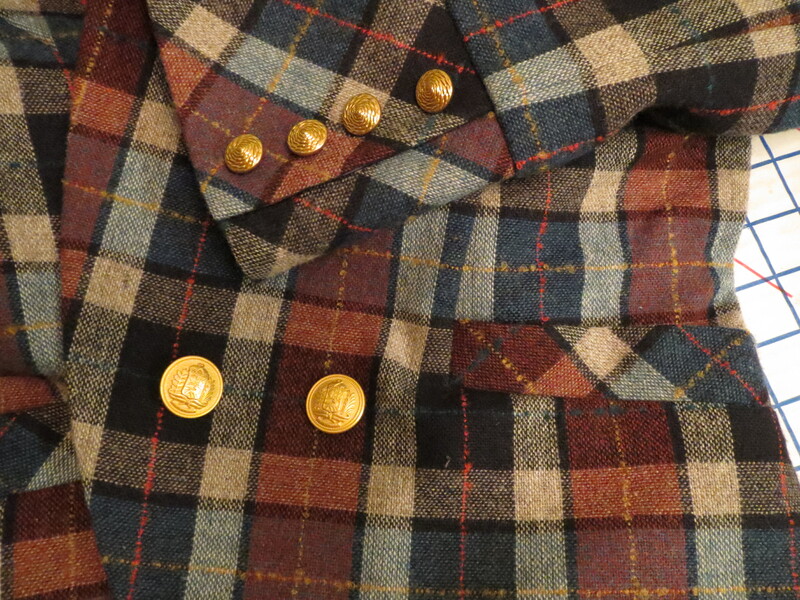 I have been remiss in confessing some recent purchases. 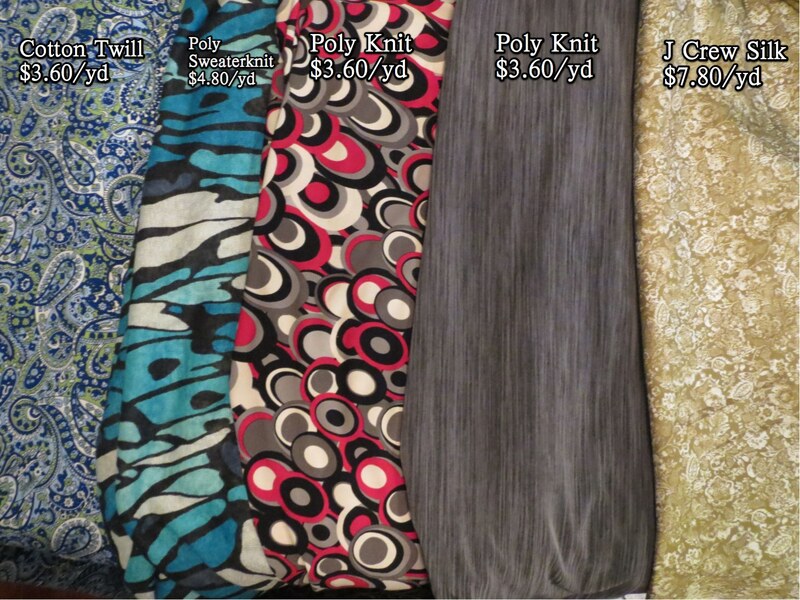 Fabric Mart got me when they put silk at 40% off. I'd been eyeing the peacock fabric on the left for a couple of months and finally pulled the trigger. 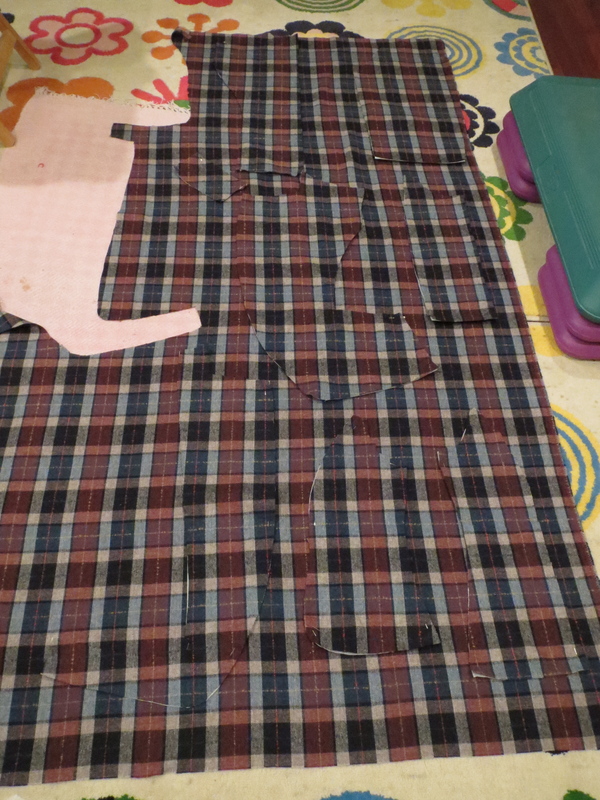 The side border print is challenging and will require a simple dress without a waist seam. 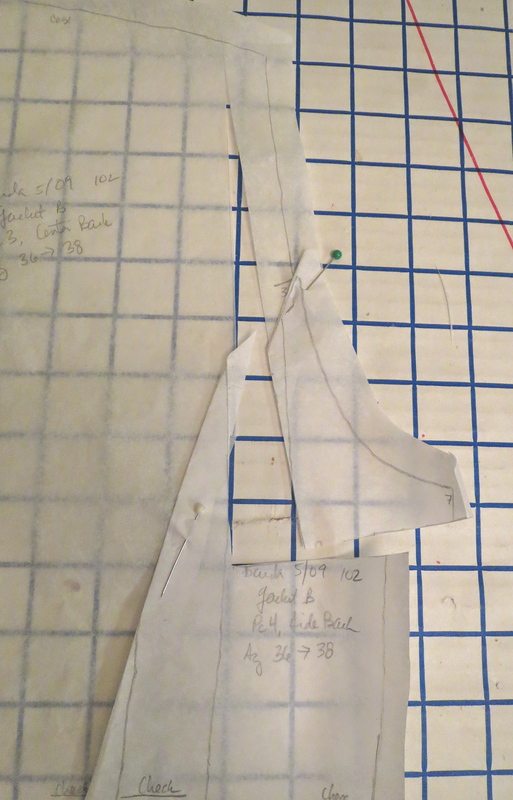 Would you believe that I have zero envelope patterns without waist seams? They are essential for fitting with my swayback. I'm going to try Burda 11-2007-110, a simple dress that will show off the print. 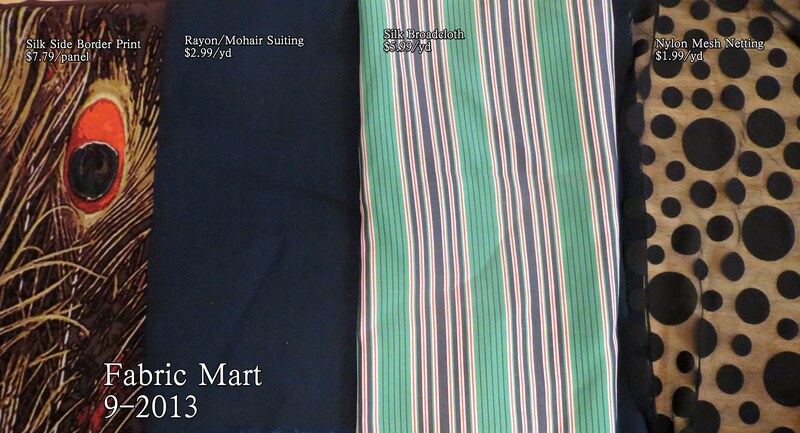 The rayon/mohair suiting was the impetus for the order, as it was the "crazy price" item. It is much better quality than I had expected at that price and I like the subtle metallic windowpaning. 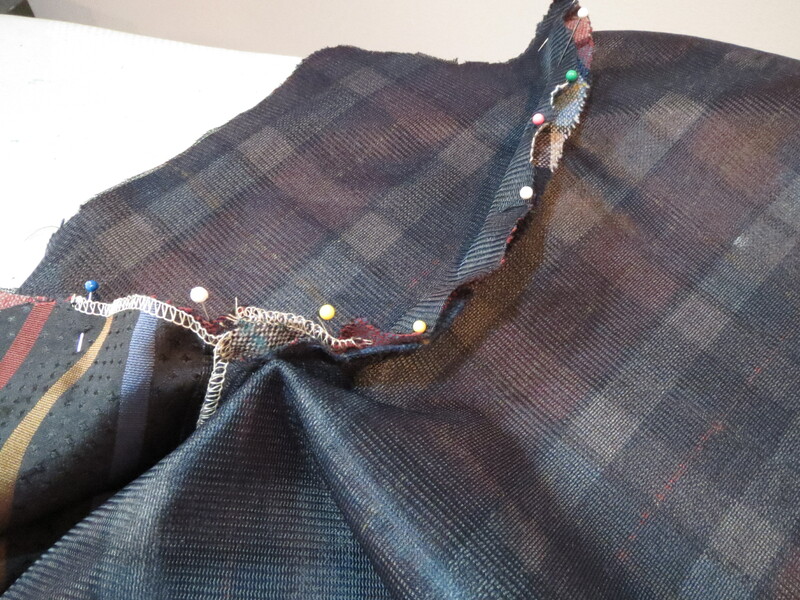 It will be a work dress. The striped silk will be a shirtdress, and the mesh polka dot knit is because when do you *not* need mesh polka dot knit? It will be a fabulous accent to any number of items. Well then a month later Fabric Mart had 40% off everything on the site. Diabolical! They know I can't resist that kind of deal. The cotton twill is a heavy denim weight with a lot of stretch. 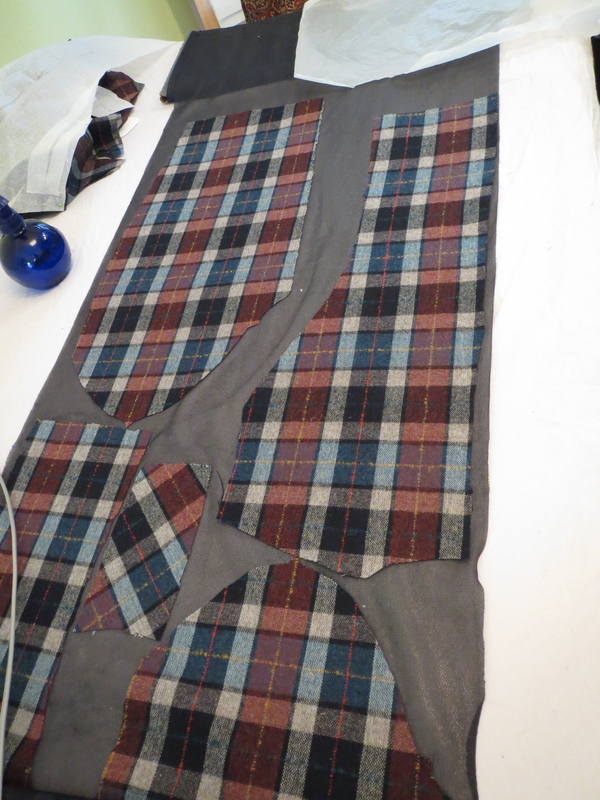 It will be a dress from Burda 08-2013-116. I'd had my eye on the blue sweaterknit for a while; I love the butterfly wing abstract print and the colors. It will be a long-sleeve tee and I might also be able to eke a dress out of it as it's very wide. 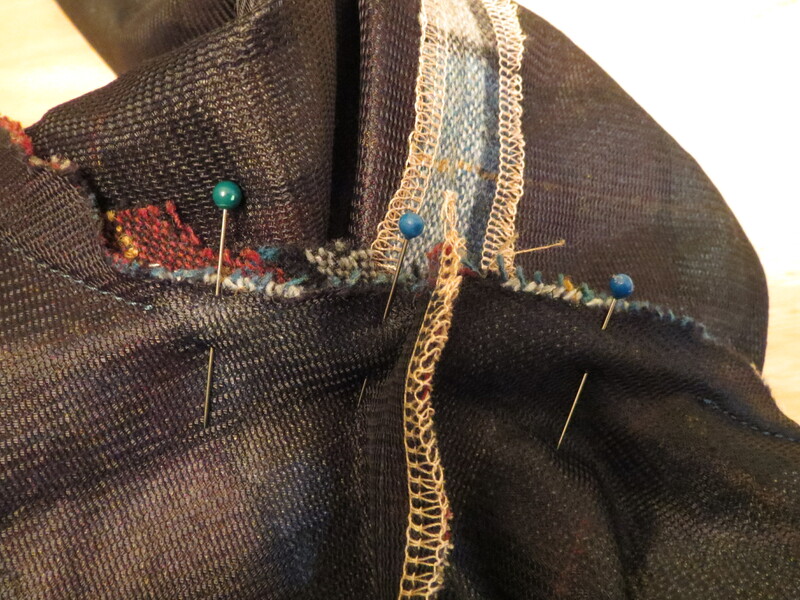 We'll see how it performs in sewing; it is rather thin and may be prone to rolling and/or disintegration. The red circles knit is for a dress. I ordered the gray to make a long sleeve Vogue 1282 Donna Karan cowl variation. I don't know why I thought it would have a sweatery texture. 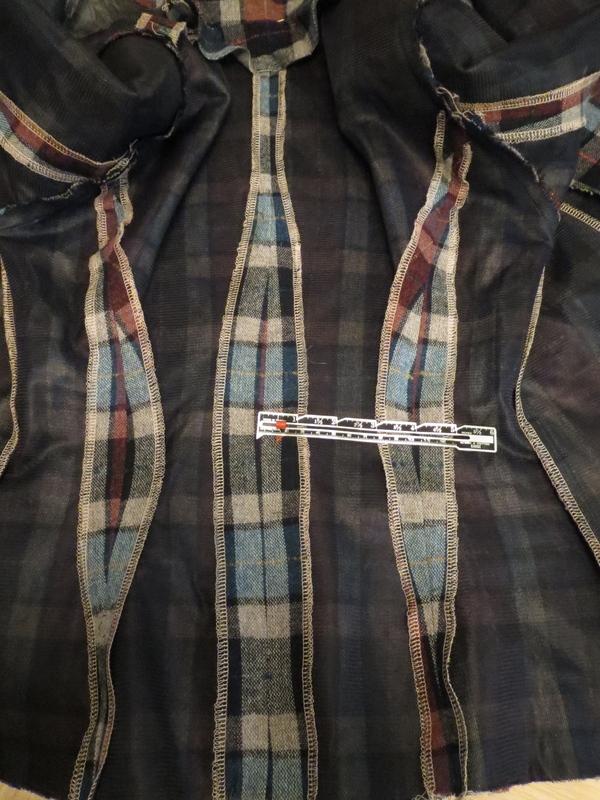 It was described as poly knit and it feels like poly knit. 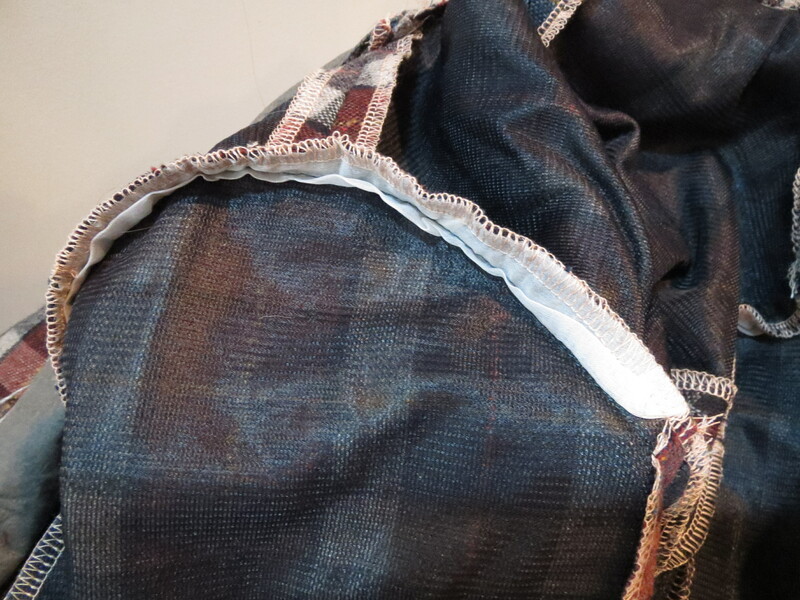 I don't think it's a luxe enough fabric for that project, though I do like the color and print. The J Crew silk was my "splurge" item. The olive/antique gold floral print is even more gorgeous and lustrous in person than on screen. It will be a long sleeve work top. My first thought was a tie neck blouse, but I'm afraid we're on the tail end of that trend and I want this to be a top I can wear for years. 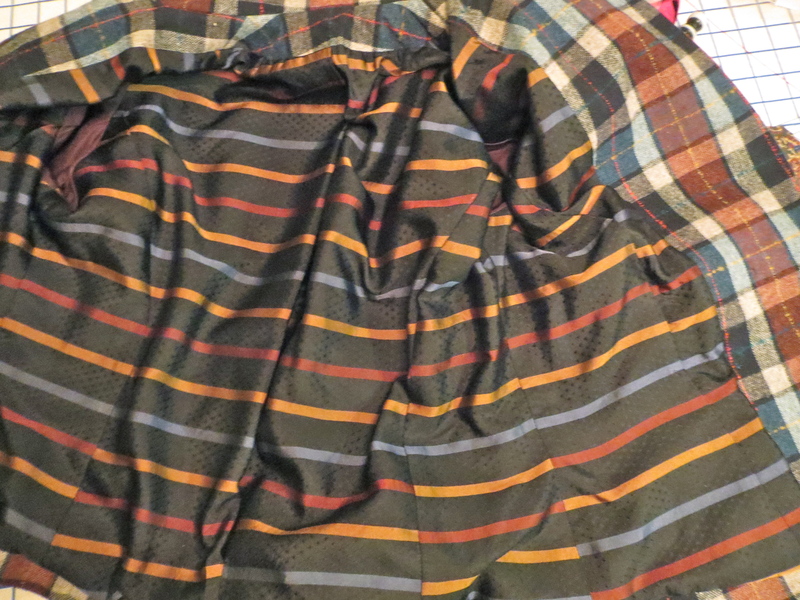 I'm not crazy about button front blouses--I feel like they're harder to wear with a skirt than pants, and I am in a skirt 98% of the time--which limits me a bit in the classic department. Any ideas? I also paid a visit to G Street (incident to a necessary trip to Home Depot, I swear!). They had these two sweaterknits on the bargain table. 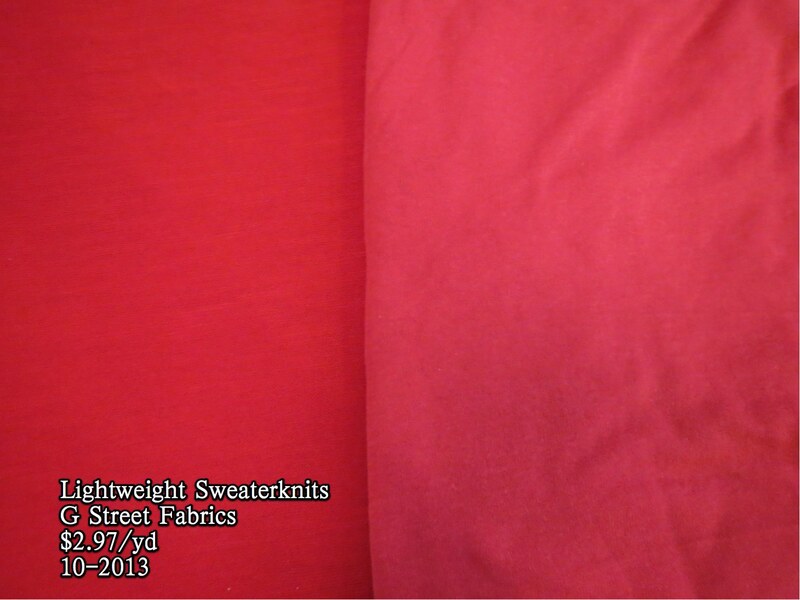 The pink is very sheer and will be a cardigan. The red is a bit thicker and will be a long sleeve tee. 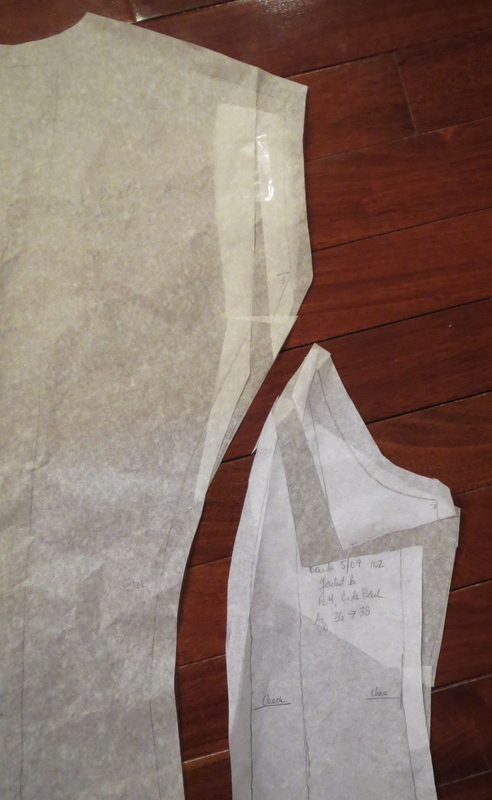 I'll either line it or double the fabric, depending on how it behaves in cutting. I am obsessed with never having the perfect red for t-shirts. I don't know why it's such a compulsion for me, especially since red isn't even in my top 5 favorite colors! My top five are turquoise, olive, hot pink/fuchsia, blue purple, orange, though my wardrobe doesn't much reflect my love of orange. What are your top 5 colors?